It is with great sorrow that the University has learned of the death of the great Irish poet and Nobel Laureate Seamus Heaney. 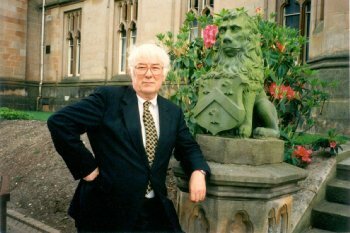 Professor Heaney, who accepted the honorary degree of Doctor of Letters from Ulster in 1992, was a great friend of the University, and opened the University’s Centre for Irish Cultural Heritages at our Magee campus in 2001. "News of the death of Prof. Seamus Heaney has just reached us. Friends and colleagues (in academia and far beyond) are phoning and emailing each other to express their ‘shock’ and to say how ‘stunned’ they are at this news. The loss, which is just now being registered, will be deeply felt. "Professor Heaney was a great poet on a national and international scale, a writer whose work was of such high quality that it is (and will remain) in the pantheon of Irish and world literature. His poems have appealed to poetry-lovers and even to people who avoid poetry – poems such as ‘Mid-term Break’, ‘Bogland’, ‘The Other Side’, ‘The Tollund Man’, ‘Chekhov on Sakhalin’, ‘Clearances’, etc. have moved readers for decades and have entered deep into their consciousness as well as into the Irish literary tradition. "It’s a measure of the man that it is hard to sum him up. In career terms, he was a poet, translator, essayist, journalist, broadcaster, educationalist, and more. In human terms, he was a great ambassador for literature in general and for all of Ireland but at the same time a humble and genial person. He began writing under the pseudonym of ‘Incertus’ / The Uncertain One and, throughout his career, cast doubt on the complacency of having too much certainty or fixity about one’s view of things that, on the closer examination which they deserve, turn out to be more complex or multidimensional. "A great poet has parted from us but his work will remain." He said: “I am very saddened to hear of the death of my good friend, Seamus Heaney. “Seamus was a giant among men. He was an undoubted literary genius - a once in a lifetime talent. “But he was also a humble and grounded individual who was very much in touch with the mood of his community and country. “Seamus was dedicated to everything that was good. He was a man who even in our darkest days dared to dream and to use his own words ‘believed in hope and history, miracles and cures’.